So, ummm, yeah. I’ve missed two Sunday check-ins (I always miss Wednesday check-ins, so no one is really surprised, right?) I really have no explanation except I’ve been working feverishly to make my novella look good in Nook, which was hindered by my Nook for PC & Nook app for android not wanting to recognize the file I popped into the folder. A frustrating few days until…VOILA!…for reasons unknown, it suddenly started working. Not going to complain. This silly thing should have been released two weeks ago. Aaah, well. What with real life (in which I spend oodles of time with Buttercup (my granddaughter, Amélie) and editing a full-length novel for release sometime this summer and joining in a few blogfests (yes, I’m an addict), I’ve not written much this last week–just a few revisions to the novella after a kind critiquer made some awesome suggestions. The week before I wrote a measly 363 words.I treasure them, though, because they’re on a new WIP that I hadn’t planned on even beginning, but its siren song called to me when I got stuck on the current WIP. Since I try to always have two WIPs going at one time (just in case I get stuck on one, I can work on the other until I can go back to the first priority), I don’t have too much guilt for caving to the lure of SHINY NEW PROJECT. 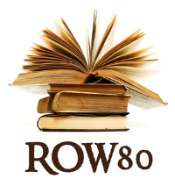 Anyway, I’ve loved the heck out of ROW80. Because of business endeavors and such, I don’t think I’m in for the next round of 80, but I’ll see you again sometime this year! Here’s the linky thingy for the rest of the ROW80 participants!